Mike and Mary Habeck of Belle Fourche, South Dakota, bought some of the heifers, as well as Lot 14 at $16,000. Jason Otto of Grace City, North Dakota, bought the Lot 43 bull and the Lots 94 and 96 heifers. 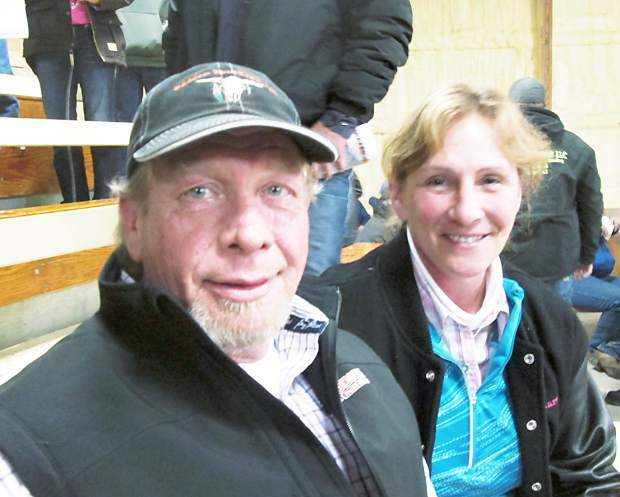 A large crowd gathered at this ranch near the Canadian border for the Barenthsen-Bullinger Red Angus Sale. This Red Angus herd is owned by Mark and Kathy Barenthsen and Jeremy and Jessica Bullinger. The weather was pretty pleasant in comparison to some years, and so folks had more time to look over these productive bulls. Hard work and customer satisfaction has never gone out of style at this ranch. The offering featured progeny from some of the most successfully proven herd sires anywhere, such as PIE Code Red 199, Feddes Big Horn Z150, Larson Sun King 016, and Feddes Gallatin Z113, to name just a few. In addition there were sons of PIE Cowboy Kind 343 and LSF Jumbo 3104, some newer sires that have been generating interest. The catalog is packed full of information to help you make your selections, and this herd has been around long enough to show their own proven genetics. The calves are raised on native grass with no creep, and then weaned in mid-October. They are not overfed so as to protect the feet and longevity of the bulls. The telephone and internet were busy, but so were the people on the seats, as they bid very aggressively to make this one of the stronger sales of the season. The top selling bull of the day was Lot 4 at $30,000. Sired by Larson Sun King 016, he was out of a daughter of BUF CRK The Right Kind U199. This herd sire prospect was born at 85 pounds and weaned at 810 pounds. Named Bar M Sun King 5045, his stats included EPDs of CED 5, BW -1.6, WW 78, YW 124, MILK 25, HPG 13, STAY 14, MARB 0.89, HB (Herd Builder Index) 155, and GM (Grid Master) 53. He had a 13.3 square inch rib eye, a 38 cm. scrotal measurement, and a 5.29 percent IMF. He sold to Nordland Stock Farm of Clearbrook, Minnesota. Laubach Red Angus, Big Timber, Montana, made Lot 7 their top selection at $22,000. This bull was sired by LSF SRR Jumbo 3104A, and was out of a daughter of OKCC Direct Design 102W. Born at 92 pounds, he weaned at 815 pounds. He had strong performance numbers, ranking in the top 1 percent for both weaning weight and yearling weight. His EPDs were BW 1, WW 84, YW 128, MILK 23, STAY 15, HB 134, and GM 50. He had a 38 cm. scrotal measurement. 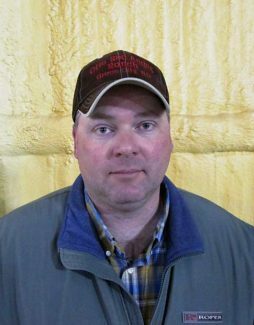 When things settled down after some aggressive bidding, Johnny Moe from White Earth, North Dakota, with his bid of $20,000, became the new owner of Lot 13, a son of PIE the Cowboy Kind 343. His mother was out of PIE Code Red 199, and he was 72 pounds at birth. This calving ease bull had EPDs of CED 7, BW -2.7, WW 63, YW 97, MILK 20, HB 103, and GM 50. Next in line was the Lot 14 bull which headed home with Mike Habek of Belle Fourche, South Dakota, at $16,000. Sired by Larson Sun King 016, and out of a daughter of PIE Venture 5036, he was born at 75 pounds. He was calving ease all the way, still with muscle and growth. His EPDs included CED 9, BW -4.4, WW 58, YW 92, MILK 25, STAY 12, Marb 0.75, HB 135, and GM 52. His IMF was 4.00 percent. Lot 5 also went to Johnny Moe. At $15,000, he was out of PIE The Cowboy Kind 343 and weighed 84 pounds when he entered the world. He weaned at 726 pounds and posted EPDs of BW -0, WW 69, YW 105, MILK 19, STAY 14, MARB 0.63, HB 145, and GM 50. The female portion of the sale was very strong, as the good mothering traits of these cattle were evident. The top bred heifers were Lots 101 and 104, with each selling for $5250, and both bred to Feddes Big Horn Z150. Teddi Dwyer of Sidney, Montana, got Lot 101, a daughter of Larson Sun King 016. Lot 104 went to John Berg of Williston, North Dakota, a daughter of Red SSS Twilight 457Z. John Berg also got the top open heifer calf, Lot 126, at $5500. She was a daughter of Loosli Right Solution 3071.